The Best of the Eels. The Smoothest and longest lasting of real leashes. This is our latest and most versatile model. The EEL incorporates a number of popular modifications all wrapped into one unit. We have re-enforced the feed port of the unit from the inside making this model more similar in size, weight, and appearance to our STANDARD REEL, while offering the increased durability of our Heavy Duty REEL RE-ENFORCED model. 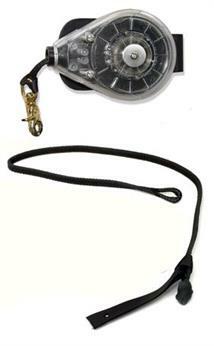 In place of our standard shock cord is a 30-inch rope extension. This rope extension is doubled over, stitched, then rubberized to toughen it up and better repel water. Our snap hook, rated at 270 pounds, is attached to the rope extension and two brass rings are attached to the leash strap. 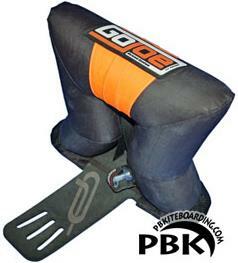 If the clip jaws give on a 270+ pound pull the clip stays with the board. A new clip can be cinch-looped onto the rope extension at a very minimal cost.